Why a Chinese Pastor Follows the God of Israel. Pastor Paul is one of a multitude of Chinese Christian leaders who has a burning desire to see his nation converted and brought into abundant life in this world and everlasting life in the world to come. He founded a church in 2003 and then sent his young leaders out to start more churches, and today he has 40 growing churches bringing the gospel to his people—the Chinese! He also has connected with many other pastors in his area, understanding from God’s Word that our Lord loves unity. Most of all, he understands that the first and foremost act of obedience to bring forth a harvest in his land is a strong network of prayer. One day a fellow pastor urged him to go to the All Nations Prayer Convocation in Jerusalem, led by Tom Hess. At first Paul thought, Why go to Jerusalem? I’m working in the harvest field in China, and that’s where my heart is. After attending the conference for the next two years, Pastor Paul began to understand that Israel is very important in God’s plan and, indeed, for the salvation of China. Pastor Paul devoured the Bible, now seeing the Jewish connection that runs from Genesis to Revelation. He also heard about Christians in the West giving donations to nonbelieving Jewish organizations, some of whom actually fight against the Messianic Jewish believers. Instead, he felt stirred to help the local body fulfill its purpose in the land. “I thought deeply about the new awakening concerning Israel that I saw happening around me among my Chinese fellow Christians. “I developed a profound desire to go deeper with my understanding of God’s plan for Israel. Most of all, I wanted to connect with the local believers. In 2011, I and my tour were in an Arab hotel in Jerusalem praying and struggling to understand what God was saying to us. How Can I Bless Israel? “‘Go through, go through the gates! Prepare the way for the people; build up, build up the highway! Take out the stones, lift up a banner for the peoples!’ (Is. 62:10). “I felt God was telling me to host a conference in Jerusalem between Chinese pastors and local Israeli Messianic Jewish leaders. I was shocked. Absolutely shocked. “I left to catch my plane and entered the airport heading towards my airline check-in counter. As I walked, I happened to glance at a man sitting by the side, looking at his iPhone messages. I recognized him although I didn’t know his name. But I remembered I had met him for two minutes at a prayer meeting some time before in Tel Aviv, hosted by Tom Hess. “Something leaped in my spirit. I went over and introduced myself, reminding him where we had met. He was Ari Sorko-Ram. He began to tell me his vision for the local body of Messiah. He told me how he had begun studying Chinese a year before. “I had brought with me an offering of about $2,000 from my churches but hadn’t known what to do with it, because until that day I hadn’t met any Israeli spiritual leaders. I had been feeling sad that I would be taking the offering back to China! “I didn’t know what the word adopt meant, and perplexed, I stopped to look it up in my Chinese-English dictionary! “Back in China, I shared with my elders the story. We prayed, and God gave me this plan—to create an alliance of Chinese Christians who will pray for Israel, who will love Israel, who will build a bridge between Christians in China and Israel’s Messianic body, and who will help Israel and China realize their destiny. “We held three conferences in China last year to bring the knowledge of God’s plan for Israel to our people. I also visited Israel several times and found the Messianic leaders I met excited about such a conference. “In 2012, some 100 Chinese and I came during Sukkot (the Feast of Tabernacles), and at our first conference we met with a number of Israeli pastors. “This year, 150 Chinese leaders interfaced with 80 Messianic Jewish leaders. We prayed, worshipped and gave Israelis opportunity in small groups to share their vision and their work in the land. I was amazed at the connections being made—even though it was through translators! “Next year, we are planning for somewhere around 100 Israelis and 200 to 300 Chinese pastors and leaders to meet, again during the Sukkot holiday. For the original article, visit maozisrael.org. 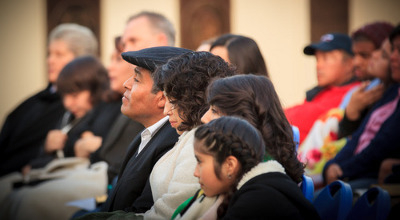 8 Reasons the Apostle Paul Would Want Churches to be Multiethnic. The apostle Paul did not go into a Greco-Roman city and plant a church for the Jews and then a church for Gentiles (non-Jews), because that would have been out of step with the gospel he loved, lived and proclaimed (Gal. 2:11-21). Paul relentlessly believed the power of the gospel could create a new kind of humanity that was an altogether new ethnic group called the church. The church would be a community where racism, classism and sexism would be defeated by gospel love (Gal. 3:24-28). The apostle Paul was so committed to the glory of God through the local church that eventually He was imprisoned and killed for planting Jewish and Gentile (multiethnic) churches throughout the Greco-Roman world. “And he said to me, ‘Go, for I will send you far away to the Gentiles.’ Up to this word they listened to him. Then they raised their voices and said, ‘Away with such a fellow from the earth! For he should not be allowed to live’” (Acts 22:21-22, ESV). “For he himself is our peace, who has made us both one and has broken down in his flesh the dividing wall of hostility by abolishing the law of commandments expressed in ordinances, that he might create in himself one new man in place of the two, so making peace, and might reconcile us both to God in one body through the cross, thereby killing the hostility” (Eph. 2:14-16). According to Ephesians 2, in Christ, Jewish and Gentile (African, Asian, Arab, Greek, etc.) congregations in Ephesus were “one new man” (v. 15), reconciled to God and each other. This new humanity was birthed through the cross (v. 16). In addition, they were members of God’s household (v. 19), God’s temple (v. 21) and God’s dwelling place (v. 22). “For this reason I, Paul, a prisoner for Christ Jesus on behalf of you Gentiles—assuming that you have heard of the stewardship of God’s grace that was given to me for you, how the mystery was made known to me by revelation, as I have written briefly. When you read this, you can perceive my insight into the mystery of Christ, which was not made known to the sons of men in other generations as it has now been revealed to his holy apostles and prophets by the Spirit. This mystery is that the Gentiles are fellow heirs, members of the same body, and partakers of the promise in Christ Jesus through the gospel” (Eph. 3:1-6). The apostle Paul was on mission to reach Jews and Gentiles and incorporate them into one local body because the gospel demanded it. “Of this gospel I was made a minister according to the gift of God’s grace, which was given me by the working of his power. To me, though I am the very least of all the saints, this grace was given, to preach to the Gentiles the unsearchable riches of Christ, and to bring to light for everyone what is the plan of the mystery hidden for ages in God who created all things” (Eph. 3:7-9). Apparently, the apostle Paul believed the gospel of God’s grace not only caused people to love Jesus, but to also love each other in such away they formed “one new man,” in spite of the first-century Greco-Roman culture that said they should hate each other. “So that through the church the manifold wisdom of God might now be made known to the rulers and authorities in the heavenly places. This was according to the eternal purpose that he has realized in Christ Jesus our Lord, in whom we have boldness and access with confidence through our faith in him” (Eph. 3:10-12). As the ethnically multicolored congregations in Ephesus read Paul’s letter, they learned the church is composed of a variety of colored people (manifold). And this unifying display alerted the rulers and authorities that is the angelic and demonic world that Jesus had indeed won. “So I ask you not to lose heart over what I am suffering for you, which is your glory” (Eph. 3:13). The apostle Paul suffered greatly to see God’s new society, comprised of multiethnic, socio-economically diverse people formed on Planet Earth. “From now on let no one cause me trouble, for I bear on my body the marks of Jesus.” (Gal. 6:17). I personally have suffered greatly, planting and leading a multiethnic church. It’s hard work. But it’s gospel. and honor and glory and blessing’” (Rev. 5:9-12). The eternal church will be multiethnic. There will be no white church, black church, Latino church or Asian church. There will only be Jesus’ multiethnic church. If this is the future, let’s pray for it today. Derwin L. Gray is the founding and lead pastor of Transformation Church, a multiethnic, multigenerational, mission-shaped community that loves God completely (Upward), themselves correctly (Inward) and their neighbors compassionately (Outward) in Indian Land, S.C., just south of Charlotte, N.C. Transformation Church was recently recognized as one of the fastest-growing churches in America for 2010 by Outreach Magazine. The Media Uses Double Standards Against Israel. When incidents that portray the truth about Israel as the victim, they are often ignored by the media. This past week, two incidents that occurred in Jerusalem received zero mainstream media coverage, outside of the Israel/Jewish-related media. If the shoe had been on the other foot, there would have been wall-to-wall media coverage, United Nations condemnations and who knows what else. At the holiest Jewish site in the world, Jews dared to sing Hanukkah songs and pray—and for this they were attacked by Muslim worshippers on the Temple Mount in Jerusalem on Sunday. In Israel, which is often falsely condemned for “oppressing” Arabs, Jews were banned from praying at the site after the Muslims attacked them. There was no media coverage surrounding any of this—no calls from world leaders about this Palestinian Arab action creating a crisis for peace talks or being an obstacle to peace. Imagine what would have happened if Jews attacked Arabs while they were praying. A 2-year-old toddler, Avigail Ben-Zion, sustained serious head injuries as a result of Arab terrorists throwing a three-pound rock through the window of the car her mother was driving in Jerusalem Thursday night. For that, there was a complete black wall of silence. Both of these incidents occurred in Jerusalem—and there was literally not one foreign or international news organization that covered either of these stories. Imagine what would happen if Jewish teenagers threw rocks at Arab toddlers. Jews pray, and Jews drive cars; they are attacked, and the media ignores it. Media ignoring these incidents is simply insane. Israel needs to act in its best interest always and regularly—and sometimes forget about negative publicity. Ronn Torossian is the CEO of 5WPR, a leading independent public relations agency. The Mystery of the Hanukkah Menorah. After the surprising Jewish victory, the temple, including the menorah, was rededicated by the Maccabees as they celebrated the new holiday of Hanukkah. (Hanukkah means “dedication.”) The lampstand at Hanukkah is called in Hebrew a Hanukkiah. It has nine lights that represent the eight days the menorah in the temple remained lit, despite having only enough oil for one day (according to tradition) and an extra candle, called the shamash, that is used to light the others. Though most American Jews call this a menorah, it is not a replica of the tabernacle menorah. Nevertheless, it was clearly meant to represent the temple menorah in Jewish religious tradition, as it commemorates the miracle of the seven-branched menorah during the temple’s rededication. The third level is found in the book of Revelation, in which John has a supernatural vision of Yeshua in a glorified form, standing in the midst of seven lampstands. It is more likely, if we are going to be consistent with Scripture, that it was either a menorah that John saw, with seven branches, or seven menorahs with 49 lights in total. The word for lampstand in the Hebrew Scriptures is almost alwaysmenorah, a seven-branched candelabra. In the Greek translation of the Old Testament, the same word is used for menorah as John used for lampstand in Revelation. In the Hebrew New Testament,lampstand is translated as menorah. Furthermore, the menorah(s) in Revelation are made of gold, just as God told Moses (Ex. 25). Each branch of the menorah (or each menorah) represented the seven churches or congregations of Asia Minor (Rev. 1:12, 20), which are symbolic of all types and streams making up the internationalecclesia, or body of believers. And let’s not forget—everything in the temple was an earthly shadow of a heavenly reality (Heb. 8:5). The menorah represents the worldwide body of believers. With the menorah is in place—just as Yeshua instructed (“But stay in [Jerusalem] until you have been clothed with power from on high” [Luke 24:49])—the fire or Holy Spirit could not only fall upon, but also function through each believer. The fruit was that 3,000 men, plus women and children, were born again that day. “Who, being in very natureGod, did not consider equality with God something to be used to his own advantage; rather, he made himself nothing by taking the very nature of a servant [Shamash! ], being made in human likeness. “And being found in appearance as a man, he humbled himself by becoming obedient to death—even death on a cross! “Therefore God exalted him to the highest place and gave him the name that is above every name, that at the name of Yeshua every knee should bow, in heaven and on earth and under the earth, and every tongue acknowledge that Yeshua the Messiah is Lord, to the glory of God the Father” (Phil. 2:6-10). Asher Intrater is the apostolic overseer of two congregations in Israel. He also leads Revival Israel and international prayer ministry in Jerusalem. He is the author of Who Ate Lunch With Abraham? andCovenant Relationships. God’s View of a Woman. Editor’s Note: What follows is the transcript of a spoken message Frank Viola delivered to a church in Chile. Keep in mind that the Chilean culture tends to have a very low view of women. After tonight’s message, if this recording gets out of this room and someone hears it in your country, I will be declared a heretic. I may even be in danger of my life. Further, after tonight’s message, some of the men in this room may not want me to come back. Thewomen, however, will want me to move here! “And the women also, which came with Him from Galilee, followed after, and beheld the tomb, and how His body was laid” (Luke 23:55, KJV, emphasis added). “These all continued with one accord in prayer and supplication, with the women, and Mary the mother of Jesus, and with His brethren” (Acts 1:14, emphasis added). Let’s take a trip back to ancient Israel and look at how women were viewed before Jesus came. Generally speaking, the Jews had a dim view of women. Jewish women were not allowed to receive an education. Hence, they were largely uneducated. Their only training was in how to raise children and keep house. Women were also largely excluded from worshipping God. In Herod’s temple, there was a special court that stood on the very outside. It was called the Court of the Gentiles. The Gentiles could go into that court, but they were limited to that area alone. Five steps above the Gentiles court was the women’s court. The women were limited to that one area. Fifteen steps above that was the Jewish men’s court. Thus men were given far more privileges to worship God than were women. A woman had no voice in her marriage. Her father decided whom she would marry, when she would marry and why she would marry. A woman couldn’t divorce her husband under any condition. Only a man could initiate a divorce. Jewish women were to be seen as little as possible in public. In fact, young men were warned about talking to women in public—so much so that it was a shame in ancient Israel for a man to talk to a woman in public. Consequently, most women stayed out of the streets. This was man’s view of a woman in first-century Israel. It was not much better in other cultures. In fact, ever since the Fall of humanity, women have been regarded as second-class citizens—inferior to men. But something happened that changed all that. In Jesus Christ we find God’s view of a woman. Not man’s view. Not the American view. Not the European view. Not the Asian view. Not the African view. Not the South American view. Not even the Chilean view. But God’s view. Jesus Christ is God made flesh. As such, He embodies all of God’s opinions. In His earthly life, Jesus was the visible expression of God Himself. By His actions and His words, we discover God’s view of a woman. And that view was utterly contrary to the prevailing view of His day. Consider this. When God decided to make His entrance upon this planet, He visited a woman. He chose a woman to bring forth the eternal Son, the Messiah—the Anointed One for whom Israel had waited thousands of years. The life of God was first placed in the womb of a woman before it got to you and to me. And God was not ashamed. Jesus was noted for palling around with sinners. He supped with prostitutes and tax collectors. We are told in John 4 that He met a woman, and He did something that shocked the disciples: He talked to her in public. And He was not ashamed. Your Lord talked to this divorced, adulterous, Samaritan woman in public, and He forgave her of her sins. And He was not ashamed. But that’s not all. Jesus Christ had a custom of using women in His parables and making them heroes. He talked about the woman who searched and found her lost coin. He spoke of the woman who was unrelenting in the presence of the unjust judge who honored her for her persistence. He spoke of the widow who dropped all the money she had into the temple treasury and praised her for doing so. And He was not ashamed.